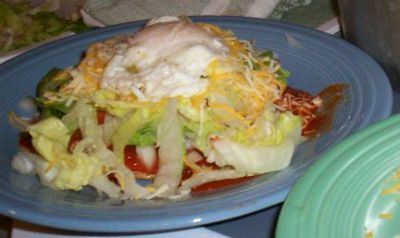 Red Stacked Enchiladas with a fried egg is a basic recipe found in many cookbooks and inside the minds of almost every cook in the southwest who has ever made them (it is that simple of a recipe!) Stacked enchiladas are a New Mexico variation where the enchiladas are stacked with a filling between each layer, green, and red sauce poured on and there is a fried egg on top. This is a truly traditional New Mexican dish. These enchiladas are perfect meal of the day and guaranteed to set your taste buds on fire! This dish is addicting once you experience of great red chile made from scratch. Enchiladas were a typical ranch house food early on, replicating the Mexican kitchen’s custom of almost always having food on the stove. Even the cooks I know today have something on the stove at almost all hours, whether it is beans, chili, estofado (stew), or something else, a good Hispanic cook can always feed the hungry. There may be as many ways to prepare enchiladas as there are ideas about where they originated. * These can be found already dried in packaged in bags in the ethnic food section and/or produce section of most supermarkets. ** Learn How To Make Corn Tortillas. Rinse the chile peppers and remove the stems, seeds, and membranes if possible. NOTE: Keep in mind that the “heat” of the chili is in the membranes and somewhat the seeds. Do not touch around your eyes or face after touching these. Even the most innocent looking peppers can be HOT! Place the prepared chile peppers in a large pot with the water added. Bring just to a boil, reduce heat to low and let simmer approximately 20 to 30 minutes until well softened. Remove from heat. Place the softened chiles, a few at a time, in a blender or food processor. Add the garlic, salt and, oregano; blend until smooth. Starting with a few chile peppers at a time makes it easier to smooth out the sauce. Add the remaining chilies, blending until all are incorporated. Water can be added as needed, until a slightly thickened sauce that will coat the back of a spoon is made. These are not included in the ingredient list as they are not traditional, and are only optional. I have found that if your sauce tastes flat or boring, you can blend in a teaspoon or so of tomato paste to give it a bolder, deeper flavor. If the chile peppers are too hot for you, a small amount of sugar can take the heat down a notch. Prepare your Toppings and set aside until ready to use. To soften a corn tortilla: Grab it with tongs, place it in hot corn oil in a skillet, turn almost immediately and then hold up to drain (you want to soften the tortilla not cook it). You can also heat them on a comal or in the microwave if the oil part is a problem for you. To Microwave, place no more than 4 tortillas in at a time, arranged in a circular pattern with the edges barely overlapping. Heat for 20 seconds, turn them over and heat for 10 more seconds. 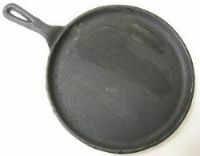 A comal is a flat cast iron cooking plate that goes over the fire and is used mainly for making tortillas, but also for roasting chile peppers and other vegetables. It is much like a griddle. A large cast-iron frying pan can be used instead. Place tortillas, so they do not overlap, on a medium-hot cast-iron griddle or in a heavy frying pan over medium-high heat. Turn frequently until soft and hot (about 30 seconds on each side). Variation: You can add all the lettuce on the last layer. Lettuce is can help take out some of the heat from the peppers. 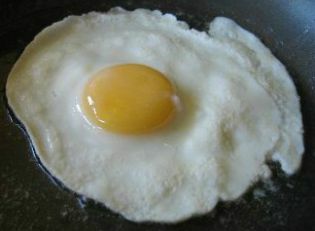 Using the corn oil that was used to soften the tortillas, fry your eggs (one egg for each serving). Learn how to Perfect Fried Eggs. Place the fried egg on top of the lettuce. If you desire, you can add some cooked meat in between the layers as well. Shredded pork is the most common, but also chicken, ground beef. or any other meat you choose. Serve with black beans, refried beans, fried potatoes, or even Spanish rice for a great meal. You are now ready to serve your enchiladas. Enjoy! I was born and raised in Carlsbad, NM and was in my teens before I discovered something other than stacked enchiladas. My mother cooked them, as did the mothers of my friends, both Anglo and Hispanic. The same with tacos. No browning the meat for us. The ground beef was spread on the tortilla and the tortilla was then dipped in the hot oil, folding as it softened. After about two minutes, the taco was turned over, cooking the other side for about a minute. I have not found this technique anywhere else, not even the rest of NM. I’m 70 years old now but still eat enchiladas and tacos the same way. My mother taught my wife (Louisiana raised) how to cook Mexican food. Great stuff. This is not Tex-Mex or strictly Mexican. It is New Mexican: the state where the official state question is “red or green?” To which most of us reply “Christmas,” meaning both red and green sauce on our food. i’m from Norwich in England but have family living in Albuquerque who we have visited many times. I am now completely hooked on enchiladas, burritos and sopapillas. 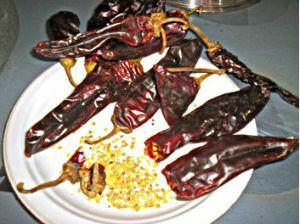 I have managed to source a supplier in England where I can buy dried red New Mexican chiles so I make my own red sauce which if I may say so is rather good. Very much looking forward to our next visit to see my family in Albuquerque and to taste that amazing New Mexican food.